Well…one of my favorite food holidays is upon us! Yep! International Bacon Day! People from all over the world will celebrate this holiday tomorrow. In my opinion, bacon makes everything better and it always puts a huge smile on my face when I smell it cooking or see it on any menu. I LOVE BACON! Not just any bacon though. I’m a HUGE fan of thick cut bacon. I don’t mess around with those thin counterfeit strips for thick cut is how this tasty meat should be enjoyed! It’s just a tease if you ask me. Give me tender, chewy, thick cut bacon and I’m a happy little camper! To celebrate the holiday, I thought I’d share one of the easiest ways to prepare this delectable, traditional breakfast food. First of all, if you’re not cooking your bacon in the oven, you’re just making extra work for yourself. The thought of bacon grease splattering all over my beautiful stainless steel stove makes me just cringe. I save myself some time by always preparing bacon in the oven over a wire rack and a parchment-lined baking sheet. All of the grease drains away (less guilt, right?) and you’re left with gorgeous strips of yummy goodness. My family prefers the edges to be well done as you can see, but feel free to cook to your desired liking! 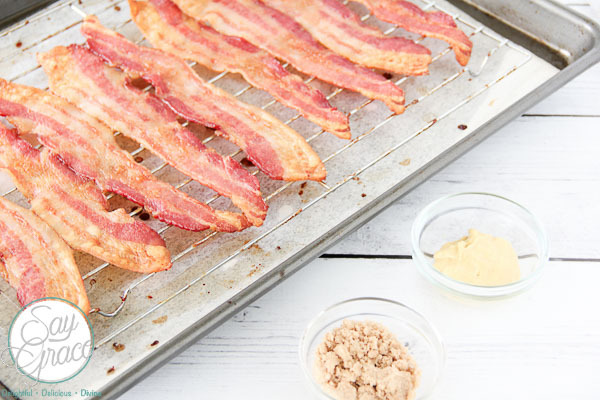 Bacon roasted in brown sugar will take your taste buds over the top with yummy goodness! Pour brown sugar into a storage bag along with mustard. Massage the ingredients together. 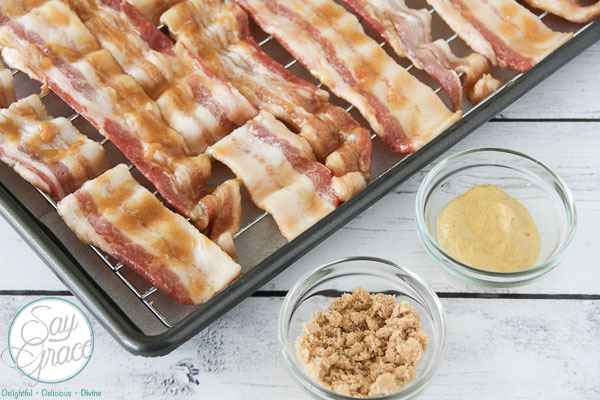 Place bacon strips in the bag and massage the brown sugar mixture into the bacon. Once coated, place strips over a parchment-lined baking that has been fitted with a wire wrack. Roast bacon for about 25-30 minutes or until desired doneness. My family prefers the edges a little dark. Say Grace and enjoy! I have never made candied bacon and I think that needs to change ASAP! We don’t eat much bacon on its own, but I love adding it to recipes to boost flavor. I’m pretty sure this candied bacon will make me just want to chow down. 🙂 And I’m so with you on the thick cut – it’s the way to go! We tend to only enjoy this treat for special occasions but honestly, I love it so much that could eat it daily. 🙂 Thanks for stopping by! Whoa! 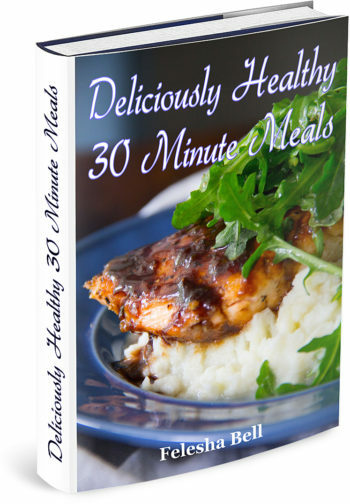 I love this recipe and it looks so easy. Take regular bacon and make it even better! I have family members that would go crazy over this! Hi Christine! I know exactly what you mean. My family goes crazy over it too! Thanks Meredith! Yep, Bacon just has a way with me! Yum!! I’ve never tried candied bacon, but it sounds amazing. Pinning to try! All of the flavor and none of the mess! WINNING!! Enjoy Tracy! 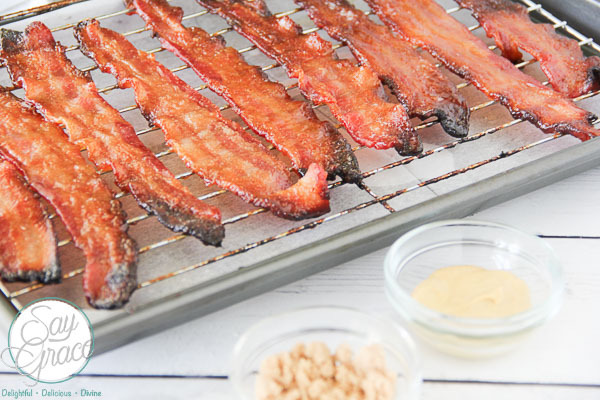 I’ve made chocolate drizzled bacon before but never candied bacon – I bet it’s delicious! Pinned! !